How can voters trust politicians that consistently say one thing yet do another? Rory Creedon reviews Peter Riddell’s lastest work, which considers exactly how our levels of respect and trust have changed following the expenses scandal, cash for questions, and other sleazy political behaviour. In Defence of Politicians (In Spite of Themselves). Peter Riddell. Biteback Publishing. 2011. 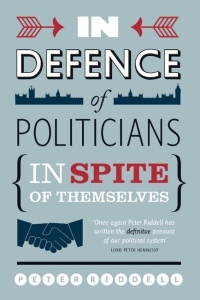 In Defence of Politicians is a punchy and spirited argument in favour not just of politicians, but of British representative politics, from the pen of a man who has been observing our governments and parliaments for decades. Journalist turned public intellectual, Peter Riddell served as political commentator for The Times for nearly 20 years and as such has a unique vantage point from which to make his case. Part polemic, part memoir, the volume is peppered with anecdotes such as his dealings with Rupert Murdoch (“the Sun King”), and the often “gruesome” press dinners given at party conferences. Additionally there are lengthy yet pertinent asides on, amongst other topics, the role of the media, the judiciary, and a look at US-style politics which all contribute to making this volume appeal to a broad audience. Riddell claims that the widespread denigration of and lack of trust in politicians is at best “unhealthy” and at worst symptomatic of a “democratic crisis”. The fiddling of expenses, sleaze, cash for questions and the controversies surrounding the Iraq war have degraded levels of respect and trust for those elected to represent the public’s interest both in government and in the Commons. The message of the book is that whilst there have been serious personal failings on the part of certain rogue politicians, we should not throw the baby out with the bathwater for two key reasons. Firstly, the accusations leveled against our politicians are often inaccurate and generally exaggerated. British politics is in fact in a much better state of health than it has been for many years. Secondly, representative government is the best type of government, and politicians are inherent to such a system. Riddell argues that MPs, far from being the “supine” self-serving careerists they are made out to be, are in fact more rebellious than ever, and willing to stand up to their party for what they believe to be right for those they represent. Evidence abounds, from the backbench protests over Iraq, and the Royal Mail, to the constant and unreported modifying of Bills to receive broad party consent. Additionally, the system of Select Committees, greatly revised under Blair, now means that government is subject to independent scrutiny on a scale never before seen, and hence the power of the party Whips has been diminished. There does seem to be a compelling force in the argument that recent reform of the House of Lords and the processes of scrutiny of government have made politicians more accountable to their constituents. There is more to be done, but Riddell argues that not enough credit is given to how well our political system is functioning. More importantly however, politicians are central to the system of representative democracy, a system that Riddell argues passionately for maintaining. Whilst he is not of the view that efforts to give the electorate more “voice” in the periods between elections are bad, he worries that attempts to further “de-politicise” decision making through the involvement of independent experts, or to devolve more decision making to community level groups will only lead to issue capture by unrepresentative non-governmental orgainisations, businesses, and the more politically active citizens. Elected representatives remain the best way for all interests to be taken into account in order to reach consensus by compromise. Yet, he argues, it is this mechanism of compromise that is the primary source of distrust in politicians, as people have “inflated expectations” as to what can be achieved in the political arena. The electorate expects a social utopia and yet the job of MPs is “to mediate and reconcile our differing interests”, meaning that not everyone will be happy all of the time. It is the failure of politicians to communicate their role sufficiently clearly in this regard that leads to distrust and malaise. This is a powerful argument, but two things should be borne in mind. Firstly, there is a large although strongly contested literature in political science (which Riddell calls “a narcissistic world of academics writing for each other”) that moving decisions closer to the people they affect is a good means of ensuring efficiency and accountability. Thus Riddell’s assertions as to issue capture are not supported by conclusive evidence. Secondly, whilst it may be true that politicians are an inherent part of a representative democracy, it is not the case that the UK political style is part of such a system, and it may be that it is this style that breeds discontent in the electorate. For example, rather than being ill informed about the nature of democracy, voters may be disillusioned with parties that promise one thing in their manifestos only to do quite another once in power. Blair brought in tuition fees, the Con-Dems raised VAT contrary to noises made in the Tory campaign, and raised tuition fees further contrary to the Liberal Democrat manifesto. Cuts have been much deeper than promised. Riddell does recognise this problem but one suspects it is more crucial than he allows for. How can voters trust politicians that consistently say one thing yet do another? Moreover, when government is challenged on such policy, it is de rigueur to pass blame to the previous government rather than argue coherently in defence of the policy. Riddell concludes the book with a set of recommendations that although sensible, are aimed at tweaking the processes of government which one suspects will not inspire a huge shift in confidence in the population at large. More difficult would be to propose solutions to the prisoner type dilemma politicians and parties find themselves in, whereby they are incentivized to say one thing to get into power and to do quite another thing once it has been attained. It could be this, rather than inflated expectations, that is the most pertinent basis for the mistrust that exists between the British people and their politicians. Rory Creedon graduated from King’s College London with a degree in law. He then moved into investment banking where he worked raising capital for companies listed on the London Stock Exchange. In 2009 he moved to Mexico to learn Spanish and spent three months visiting the remaining Indian peoples deep inside the BOSAWAS rainforest of Nicaragua before returning to London to enrol in the MPA programme at the LSE. He is particularly interested in trade issues, particularly market access for developing world products. Read more review by Rory.